Ubisoft Blue Byte's latest Anno is satisfying, but ultimately a finite experience. I went into Anno 2205 expecting something a bit different. I knew that it wasn't a pure city simulation like Cities: Skylines, sticking closer to something like Age of Empires: part city building, part real-time strategy. That's the correct region Anno 2205 falls into, but the execution is a bit different. Previously, the Anno games took place in earlier eras like 1602, 1701, and 1404, but the last entry in the series brought the series into the future. The success of Anno 2070 made developer Ubisoft Blue Byte double-down on space-age building, thus resulting in this title. In the future, governments have given way to corporations. You're thrust into the era and given a corporation of your own to manage. You'll need to build up your terrestrial and lunar operations, expand to new claims, and ultimately become the leading corporation. While you're taking part in all this corporate intrigue, you'll also need to fend off attacks from the lunar-based Orbital Watch. Anno 2205 is a stunning game. In the lulls, you can just sit and watch your cities toil away. Each building is like a tiny living diorama; you can see resources being pulled from a mine or watch a power lifter amble around your spaceport. I think the game could use more building variations, as your cities will begin to resemble vast carbon copies of the same building, but Blue Byte did a great job of giving you something to look at. 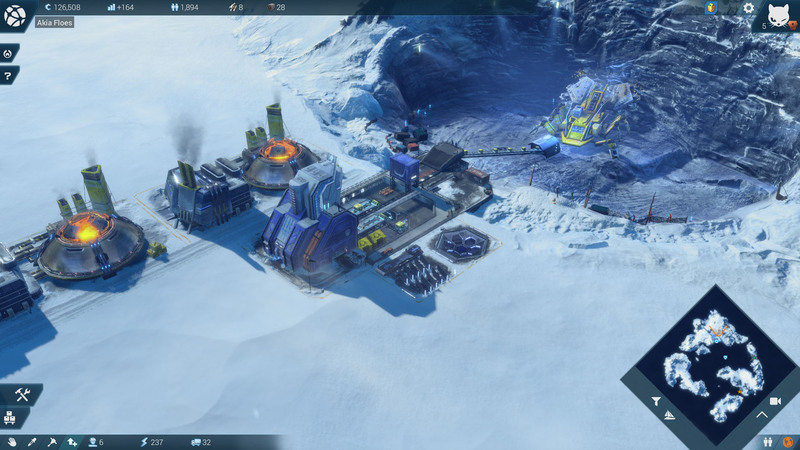 Anno 2205 splits itself across three different playable environments: Temperate, Arctic, and Lunar. Each environment has a different series of buildings, citizen types, and resources to draw on, and in the campaign, players will work their way through them all. You'll begin in the Temperate climate, which forms the base of your corporate operations. It has the most basic workers and materials, while you'll draw upon claims in other regions for more exotic materials. Anno 2205 works on a session system. Each environment has different maps that operate independently. To switch from the Arctic to Lunar environments, you have to zoom out to the global map, click on the map type you watch to switch to, let it load, and then enter the map. Your finances are shared, but everything else is specific to a certain map. To make everything work smoothly, you need to trade between your various regions. Citizens on a Temperate map may want Neural Implants, which can only be developed with materials from the Arctic, while Arctic citizens may want Vitamin Juice, which can only be made in a Temperate map. I was surprised with how amazingly straight-forward Anno is. Each building houses a certain number or type of citizens and as long as you're producing enough of the resources they require, they're happy. Keep them fully satisfied with all their favorite amenities and you can upgrade them to the next level of citizen: in the Temperate climate Workers upgrade to Operators, who can then become Executives. Each level requires more complex amenities, usually requiring resources from a different environment. You don't need to worry about some of the issues present in Cities: Skylines or SimCity. Traffic isn't a concern at all; as long as there are roads connecting everything, it's all good. The answer to most problems is to build more. Need more power? Drop a new Wind Turbine or Geothermal Power Station. Need more food? Add another fishing hole and cannery. There's also a modular upgrade system, allowing you to augment certain buildings to increase production, lower maintenance costs, or minimize the required logistics to move goods. Producing more of one good will cause a shortage of another, thus necessitating more building. You're spinning plates; finding enough power, mining enough resources, and making sure the results get to the right regions. Anno's cities can look a bit cookie-cutter as they get bigger. In Cities: Skylines, I need to worry about how far the industrial sector is from the residential sector, because the citizens actually travel the distance. I have to think about fire station coverage, public transportation routes, or cargo traffic. Road patterns are painfully important and planning ahead is key. Cims hates being near industry, so you have to take that into account, too. 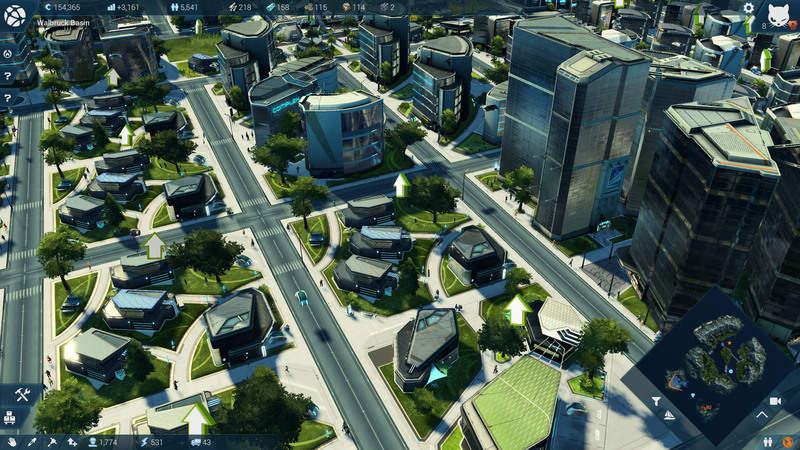 In Anno 2205, the answer is just finding enough space to fit everything. It's a spatial puzzle more than anything else. When I want more soy beans, I just need land for that specific type of farm. It doesn't matter where I place it on my claims, it's just automatically added to the total of soybeans I produce overall. Anno 2205 tells you, "here are the things your citizens require," and you just need the space and money to fulfill those requirements. Put a residential center next to a factory? Your citizens won't give a damn as long as they have their processed food and security. There are constraints, but those are dependent on climate. The Temperate regions are power hogs and Wind Turbines are more efficient when they're spaced out. The Arctic only allows citizen dwellings within a heat bubble defined by your warehouse and other factories. On the Moon, you need to build within shield generators to protect your colonies from meteor showers. Building in each region is slightly different, but the game is still pretty simple. Anno 2205 probably has my favorite building tools of any city building game. You can place buildings and move them at any time without any penalty. If you decide that one of your claims is going to be residential-only, you can just move the farms to another claim. Need to build a bunch of buildings for executives? Just copy and paste what you already have. Anno 2205 realizes that I don't want to be locked into certain decisions and makes it easy to change course. My only issue is camera movement isn't on WASD, because those are building tool hotkeys, but it's a small problem. The relative simplicity is why Anno 2205 works. I first sat down on the game and busted through six hours of play in no time flat. It's satisfying. You build things, your claims get bigger, your create more resources, and then the loop continues. It's easy to see what you're missing and fulfill that need. In Cities: Skylines, I can't tell you how many times I've restarted because things aren't going quite right. 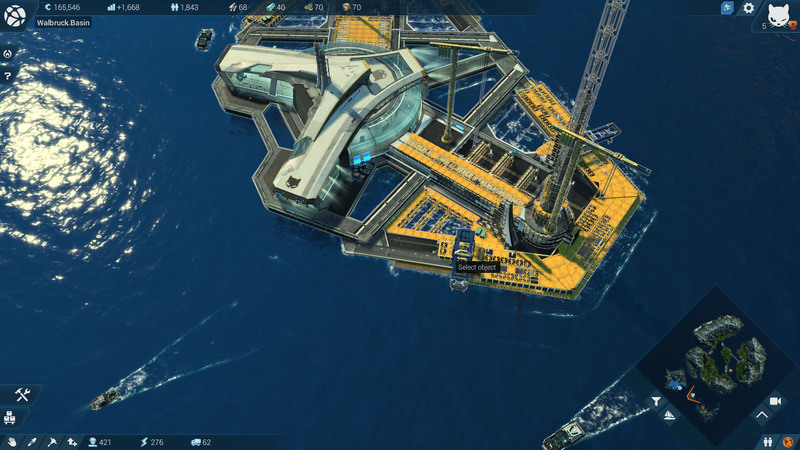 In Anno 2205, I just shift things slightly and move on. That's also one of the major problems with Anno 2205. It's pretty easy to complete the campaign and once you do, there's not much else to see here. You can expand some more, but that's the extent of the game. There's no Steam Workshop for mods to lengthen the life of the game. It's a remarkably linear game and it needs more DLC or modding options. The second problem is the mostly extraneous naval combat system. This combat takes place in completely separate maps called Crisis Centers. You have a fleet that can wander around the map, attacking Orbital Watch ships, and collecting resources. It's the most basic RTS gameplay possible and you have little control over the make up of your fleet; it's determined by your corporation size. If it wasn't for one little niggle, you could ignore the combat completely. To add modules to different industrial buildings, you need resources that are only found in combat. Later in the game, modules are necessary to proceed, meaning you'll need to dig into the combat mode. It's rote, clicking around maps, attacking enemies, healing your ships with drones, and so on. The fighting feels like an odd vestigial tail for the game. I could understand if it was directly integrated into the building mode like an Age of Empires title or if there was more you could do with your fleet, but that's not the case here. There's little strategy in the combat: I just cruised through with all my ships at once, healing occasionally or using special items to whittle down stronger foes. This is the major part of Anno 2205 that needs more work. I like Anno 2205. It's only a marginal upgrade of Anno 2070, but it's enjoyable. You'll waste hours building our your claims, trading resources, and building out some more. Once you're done with the game though, you're done, as there's no further path forward other than rote optimization once you've finished the campaign. Until then, I really dug Anno 2205. I got in, had fun, and got out. You probably will too. 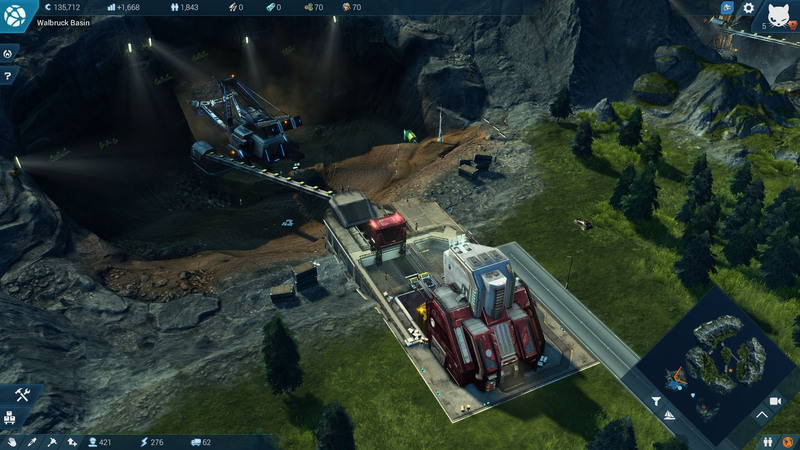 Anno 2205 uses Ubisoft's UPlay platform. If you do not like UPlay, this is not the game for you. The game ran fine for me, had some dips in framerate here and there, but no outright crashed. The interface works well, especially when it comes to building. Once you've finished the campaign, you'll play a bit more, but that's the extent of the experience. Anno 2205 is an absolutely gorgeous city builder. Blue Byte outdid itself. Anno 2205 is a satisfying city builder for those who may think that Cities: Skylines can be a bit complex. It looks great, building your cities is a breeze, and managing resources is easy. Unfortunately, once you've finished the campaign, there's not much left but more optimization and expansion. No mods or DLC make this a rather finite game. Tagged with Reviews,	Ubisoft,	Ubisoft Blue Byte. Civilization already went Beyond Earth, now Blue Byte's colony management sim is taking a shot at the moon.